Porcelain Veneers versus a Crown: Which is right for you? Gone are the days of being unhappy with your smile, but understanding your options can be overwhelming. If your teeth have spaces between them, are crooked, chipped, or discolored, dental crowns and porcelain veneers may be an option for you. Understanding the difference between these two options is not something you will have to do alone, as the friendly staff at the office of Dr. Paul Reese in Mountain Home, Arkansas is here to help. Below you will find the comparison between veneers and crowns to assist you in scheduling your consultation. 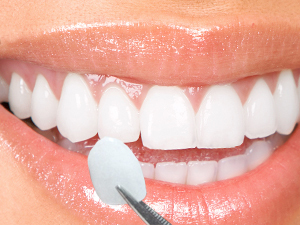 Porcelain veneers consist of several thin layers of ceramic that are applied to the original tooth. In order for the veneer to look natural, a small amount of enamel must be removed. Once the enamel has been removed from the front and sides of each tooth, your dentist will take an impression of the prepared teeth. From here, the impressions will be sent to a laboratory in order to ensure each veneer fits perfectly. Upon the return of the fabrication, your dentist will then use a dental adhesive to bond each veneer to the specific tooth. 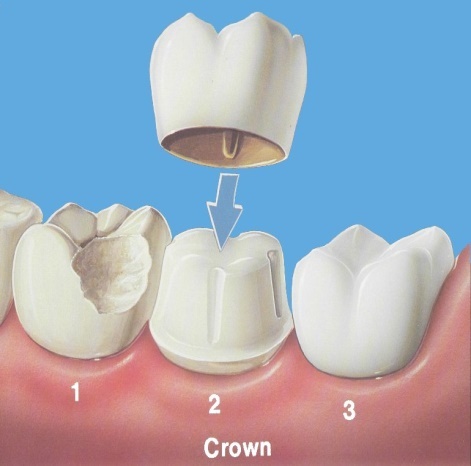 Dental crowns are covers or “caps” that can be placed onto a tooth to restore the tooth to its normal function and shape. Crowns are made from several types of materials: porcelain, metal alloys, ceramic, composite resin, or a combination of those listed. To prepare a tooth for a crown, the outer portion of the tooth must be removed along with any decay. An impression is made, and a temporary crown is then placed while you wait for the laboratory to complete the finished crown. Once completed, your dentist will use cement to ensure the crown will stay in place. Whether you are looking to repair a tooth that is chipped, decayed, or discolored, you do not have to make a decision alone. Call Dr. Paul Reese in Mountain Home, Arkansas today at (870) 424-5900 or visit www.reesedenistry.com to see all our services and to schedule your consultation to determine if a porcelain veneer or dental crown is right for you. Everybody wants a nice smile. Dr. Reese can help you achieve that desire with orthodontic treatment in Mountain Home. There's no denying that a set of braces can help deliver a beautiful mouth full of straight pearly whites. But straight teeth is only the beginning to the plethora of benefits you will receive from braces. Did you know that crooked teeth actually experience more tooth decay and gum disease than straight teeth? The improvement in your overall dental hygiene that comes with braces, will result in less oral disease. Crooked teeth overlap and tend and create tight cracks that provide an excellent place for plaque build up. Those tight cracks are more difficult to brush and floss properly, which leads to nasty tooth decay. Once your teeth are rightly aligned and spaced, you'll find it's much easier to take good care of your mouth because you'll be much more effective in your brushing. As a result, your teeth will be healthier! Who doesn't love a healthy mouth?! Did you know your teeth have a lot to do with your ability to speak properly? Your speaking patterns can, in fact, be affected by the line of your teeth and the way they lean. Having good orthodontic treatment will actually change the positioning of your teeth and help you to talk more clearly and have better pronunciation. An added benefit of speech improvement is that you or your child may experience an increase in self esteem. 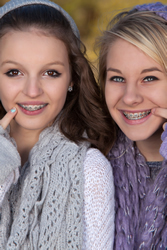 Did you know braces will also result in better protection of your teeth? Crooked teeth don't have a regular bite pattern. This means your teeth have uneven stress or pressure. There can also be too much pressure on the jawbone with a bad bite pattern. This all leads to bone erosion. Bone and gums begin to erode when there are no teeth to support. This also happens when your teeth aren't rightly aligned, leaving gaps. This leads certain teeth to wear at a more rapid pace and causes premature dental issues. Eventually it may lead to needing to repair or replace damaged teeth. Proper alignment can prevent that. Being aligned properly also helps to prevent damage that can be caused to protruding teeth, especially to someone who is very physically active, for instance, a teenager active in sports. With an uneven bite pattern there can also be too much pressure placed on the jawbone, which can cause a variety of issues including headaches. Did you know your teeth play an important role in proper digestion? The first step to digestion, before the food ever even graces your stomach, is for you to chew it. Did you know your food is already partially digested before being completely swallowed? When your teeth are crooked or worn and jagged they aren't in line. Misalignment causes you to be unable to tear the food apart, like you need to, for proper digestion. Once your teeth have been straightened with braces, you'll have the ability to chew your food better. This is safer for you and will result in easier digestion. One last thing you should know...Dr. Reese and his friendly staff at Reese Family Dentistry will be happy to answer any and all questions you may have about how braces can benefit you!